As I discussed in my last article Oracle Multi-tenant Application Containers Part-I, Oracle Database 12.2.0.1 introduces the concept of multi-tenant application containers that enable many PDBs to share application objects such as code, metadata, and data so that application administrators can now efficiently manage many application PDBs as one in a single Application Container, while securely isolating their individual customer-specific data. In this second article in the series, we will learn how to create an application container within a CDB. Here, we have an Oracle database 12.2.0.1 CDB called orclcdb as shown. Within this CDB, we will create an application container for sales application sales_app whose common objects will be shared by four application PDBs North_app_pdb, South_app_pdb, East_app_pdb, and West_app_pdb. The application common objects for sales_app will be stored in application root sales_app_root. Also, we will create an application seed PDB called sales_app_root$seed. Let us first connect to CDB orclcdb and verify that currently a CDB root and seed are associated with it. There are no user created PDBs. A new application container can be created just like a regular PDB using the CREATE PLUGGABLE DATABASE statement, but we need to include the AS APPLICATION CONTAINER clause and specify a container name. As a result, an application container having the same name as the application root gets created. Let us create the application root sales_app_root, which implicitly creates the application container sales_app_root as well. It is worth mentioning here that an application root belongs to only one container; i.e., CDB root (CDB$ROOT). The application root has its own service name, and users can connect to the application root in the same way that they connect to a PDB. Connect to application root sales_app_root and note that when the application root is opened for the first time, the database automatically creates an implicit application with the name APP$<guid>, where guid is the global unique ID of the application root. Let us install application sales_app version 1.0 in application root sales_app_root. The application creates an application common user named sales_app_user, grants necessary privileges, and then creates a metadata-linked table named sales_app_user.customers. These common application objects for application sales_app will be shared with the application PDBs that belong to the application root. Now we have created common objects for the application sales_app in application root sales_app_root. Next, we will create an application PDB which can share these objects. Currently no application / seed PDB is associated with the application container sales_app_root. Let us create application PDB north_app_pdb from CDB seed PDB$Seed. Now an application PDB north_app_pdb is associated with the application container sales_app_root. Connect to the north_app_pdb application PDB and check for the presence of the common application table sales_app_user.customers. We can see that the common application table sales_app_user.customers cannot be accessed from the north_app_pdb application PDB since it was created from CDB seed, which cannot share common application objects created in the application root. As a result, the application sales_app is not yet registered with the application PDB north_app_pdb . We will now synchronize north_app_pdb with the application root so that the application sales_app gets registered with it and common application objects are visible to north_app_pdb. Hence, an application PDB created from a CDB seed needs to synchronized with the application root so as to access common application objects. Next, we will create an application seed database which can serve as a template for creating future application PDBs within the application container. An application seed can be created from the CDB seed, an existing application PDB, or an application root container. Presently, we will create a new application seed from the CDB seed (PDB$Seed). Note that name of an application seed has the format <application_root>$SEED. Here it translates to sales_app_root$seed. Open the application seed and note that application sales_app is not yet registered with it since it has been created from the CDB seed, which cannot share common application objects created in the application root. Hence, an application seed, when created from CDB seed, is not synchronized with the application root. Let us now create an application PDB east_app_pdb from this unsynced application seed. Open the application PDB east_app_pdb and note that it is as yet unsynced with application sales_app since it has been created from an unsynced application seed. Hence, an application PDB when created from an unsynced application seed is created unsynced with the application root. Let us synchronize the application seed with the application root so that the application sales_app created in application root gets registered with it. Let us now create an application PDB west_app_pdb from this synced application seed. Verify that the application PDB west_app_pdb is synced with the application sales_app, as it has been created from synced application seed. Hence, an application PDB when created from a synced application seed is created synced with the application root. We saw that we need to manually sync an application seed created from a CDB seed. Let us now drop the application seed and recreate it from the application root sales_app_root. When we open the application seed, we get a warning as the pdb_to_apppdb.sql script must be executed on the created regular PDB for it to become a full application PDB. Non-Application ERROR   Non-Application PDB plugged in   PENDING   Run pdb_to_apppdb.sql. tion PDB                es pdb_to_apppdb.sql be run. ..... Part of the output follows . . . .
tion PDB                  es pdb_to_apppdb.sql be run. Note that the application seed is in sync with sales_app since it was created from the application root that houses the application. Another method of creating a synced application seed is to create it from a synced application PDB. In this case, we need not run script pdb_to_apppdb.sql. We will drop and recreate the application seed from the synced application PDB north_app_pdb. 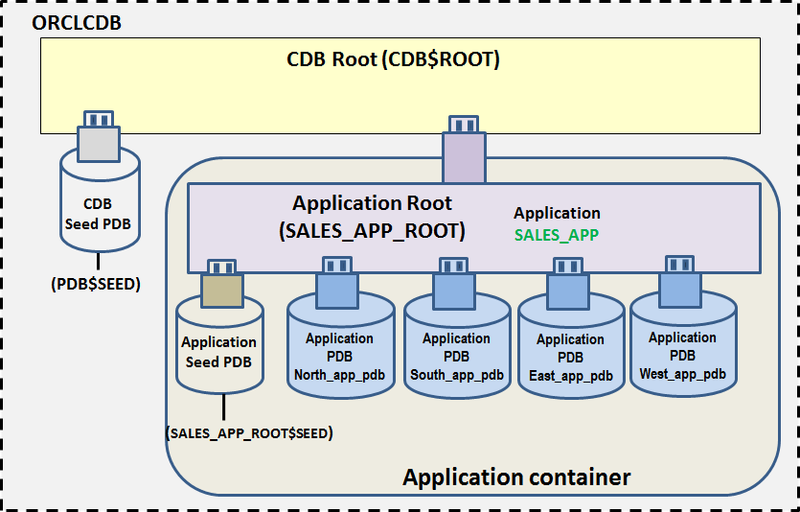 It can be seen that the Seed database is automatically synced with the application sales_app since it has been created from a synced application PDB. Similarly, it can be shown that if an application seed is created from an unsynced application PDB; e.g., east_app_pdb, it gets created unsynced. Hence, the synchronization status of an application seed created from an application PDB is same as that of the source application PDB. Note that the application PDB south_app_pdb has been created synced with the application sales_app since it has been created from the synced application PDB north_app_pdb. Had the application PDB been created from an unsynced application PDB, e.g., east_app_pdb, it would have been created unsynced. Hence, synchronization status of an application PDB created from another application PDB is same as the source application PDB. In this article, we learned various methods of creating application PDBs and application seeds. Note that here we have created just one application in the application container, but it is quite possible to create multiple applications (e.g., HR application) within an application container and various application PDBs can be synchronized with separate applications as desired. Application root contains application common objects which are visible only to the application PDBs and seed PDBs within the container when they have been synchronized with the application. It is possible to create multiple applications within an application container and various application PDBs can be synchronized with separate applications as desired.